Sweet Metel Moments: Free Printable - Teacher Appreciation - "Berry Nice Teacher"
Free Printable - Teacher Appreciation - "Berry Nice Teacher"
For Day #3 of Teacher Appreciation Week, Brody is giving his teachers some berry hand soap and bubble bath. 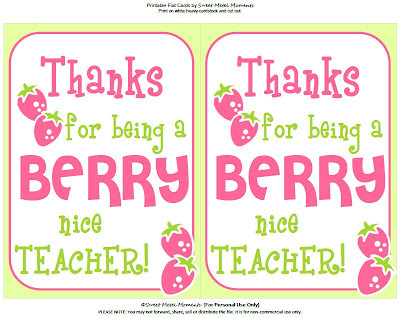 I embellished a plain white gift bag with a 5x7 flat card that I created that says, "Thanks for being a berry nice teacher!" What's great is that I purchased all of the items (the hand soap, bubble bath, and gift bags) from Dollar Tree! And with a free printable that you can download from clicking on the image below or HERE, you can create these gifts on a small budget too! Thanks for sharing this printable! It is EXACTLY what I was looking for. I shared what I did on my blog and linked back to this blog post so others can see your talent. With teacher appreciation week starting tomorrow, I remembered you and checked out your blog. Thank you so much for sharing your talent with us, mere mortals! Miss you guys so much!